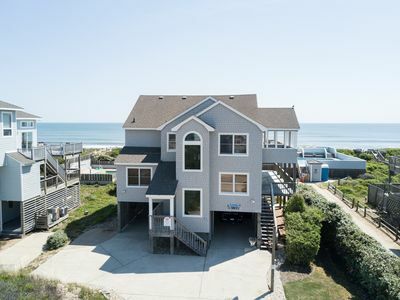 Vacation in a fully renovated cedar shake home , just a stone's throw from the Atlantic Ocean in the Sanderling section of the Outer Banks of North Carolina. 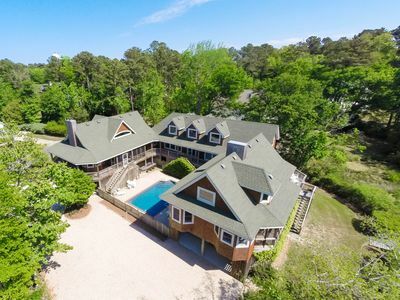 Draped by age-old live oaks, this beautifully crafted 2,600 square foot vaulted ceiling house offers two master bedrooms with king beds on the main floor, each with their own full bath. 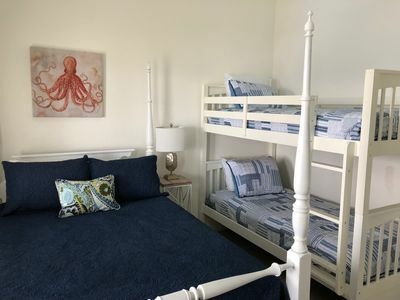 Above, there is a queen bedroom and bunk room with four twins, which share a Jack and Jill bathroom. All bedrooms have flat screen televisions. 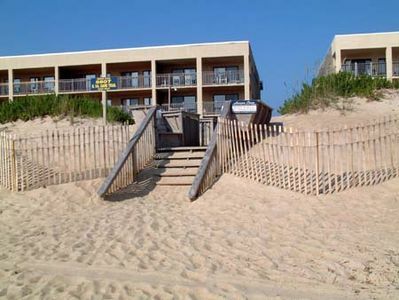 The beautifully appointed bedrooms are accompanied by a great room with a fireplace, flatscreen television. large dining bar and new dining table for 10, kitchen with Bosch dual-fuel range, double door refrigerator with ample freezer drawer, and a fully equipped gourmet kitchen. 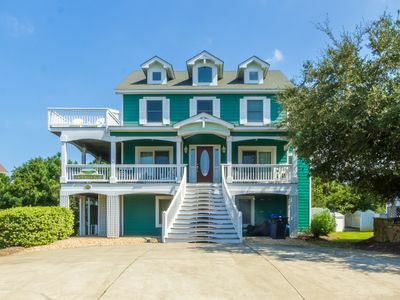 On the Albermarle Sound side of the great room is a comfy living room with a flatscreen television and on the ocean side is a bright reading room set apart by solid fir pocket doors for quietude or an afternoon nap. 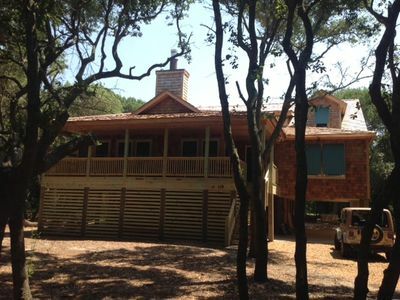 The house has WiFi and toll-free long distance telephones in case cell service is low. 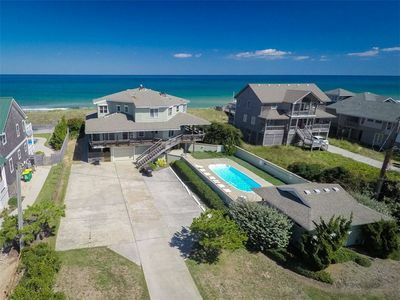 Our neighborhood, Sanderling, features a new pool on the Soundside along with tennis courts and a boat ramp. 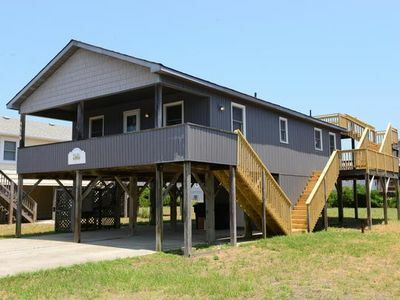 The Sanderling Inn, across the street, has an outside bar, nightly fire pit with local musicians, and two of the area's finest dining establishments...the Life Saving Station and Kimball' Kitchen. A terrific spa is also available. 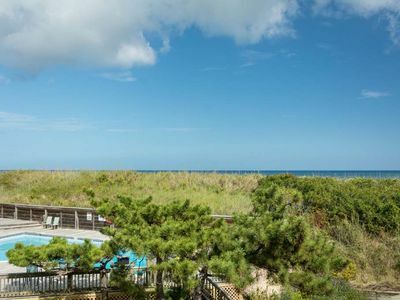 Nature is one of the many highlights of the Outer Banks. Most any night there are deer, fox, and bunnies roaming the neighborhood. During the day, dolphins feed on the shoals and entertain beach goers...no binoculars needed. A 400-year-old herd of Spanish mustangs roams the dunes about ten miles north of our home. Several companies offer excursions to see the herd or you can take your own four-wheel-drive vehicle onto the beach to try to find the ponies on your own. Local seafood is abundant. For cooking at home there is no better place to purchase fish than Carawan's on the 158 Bypass. This longtime purveyor features locally caught tuna, snapper, grouper, Mahi Mahi, shrimp, blue crabs, mussels and much more. Go to Maine if you want lobster. For dining out, there are many choices. 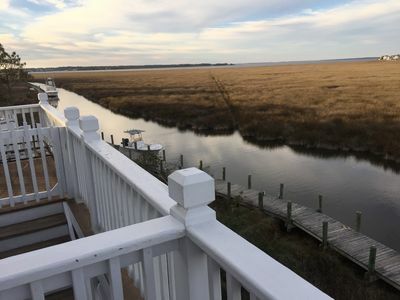 The Paper Canoe is walking distance and showcases the spectacular sunsets over the Albemarle Sound. In the town of Duck, there are Red Sky, Roadside Grill, Cravings, and Blue Point restaurants. For casual meals in Duck, the Duck Deli is your best bet. A short drive south to the beach road there is the Rundown Cafe. Anything but rundown, this gem features creative fare including Mahi Mahi burritos. Another southwestern flavored restaurant is the Bad Bean on the 158 Bypass. The smoked beef brisket tacos and burritos are scrumptious. History lovers get ready for some treats. A short drive south of our house is the site of the Wright Brother's inaugural flight. The museum and outdoor attractions there are a National Park. 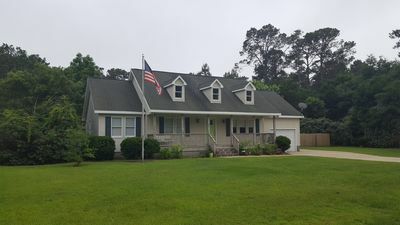 Further south in Manteo is Fort Raleigh. This is where Sir Walter Raleigh founded the Lost Colony. The gardens and fort are definitely worth a stroll and the outdoor drama depicting the colony's settlement and mysterious demise is terrific for all ages. 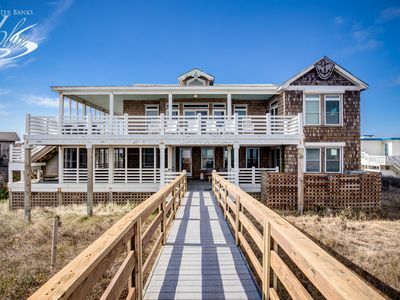 Lighthouse fans will find four exceptional examples on the Outer Banks. The closest to Sanderling is the Currituck Light, which is about eight miles north of Duck Forever. This is a beautifully maintained light that can be climbed to reveal spectacular views. Also within a day trip adventure are Bodie Island, Cape Hatteras, and Ocracoke Island Lighthouses. The first two are open for climbing. 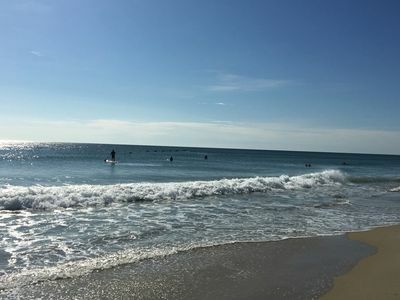 Water sports are very popular in the Outer Banks. Just across the main road there is a local company that will set you up with jet skis, parasailing, kayaks, paddle boards, and the like. Or bring your own kite board for fast runs on the Atlantic. Golf courses abound in our area. 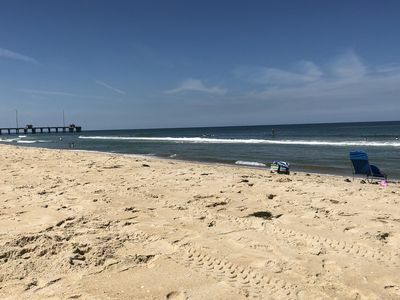 We most highly recommend Nags Head Links, which is about a 30-minute drive south. Leave your driver in the bag. This is a tight course that runs along the sound. If you miss the fairways, you'll likely be using a different ball for your next shot. Shore, pier or deep sea fishing are very popular in the area. There are multiple companies that will set you up, but our favorite is Bob's Bait and Tackle in the center of Duck. 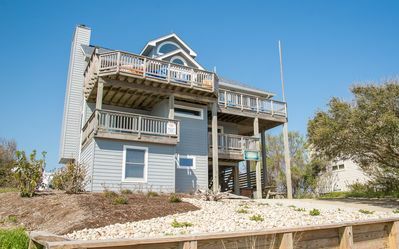 So whether it's peace and quiet you seek on a private beach, a family-friendly neighborhood without traffic, or some of the nation's most popular historic sites, Duck Forever is the best value and newest property in the neighborhood. We are already booking for 2019. 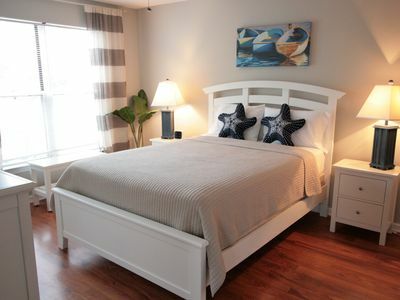 Our returning guests will notice lots of wonderful additions to our home. There’s a beautiful new, and bigger, dining set. It seats ten, so your whole crew can chow down together. You’ll also find new “beachy” porcelain dishes, glassware, utensils, flatware, cutting boards, and frying pans. There are several new area rugs throughout the house to make the entryway, master bedroom and hallways more decorative and welcoming. The entire house is now outfitted with plush bright white bath and hand towels. The bedrooms have been supplied with upgraded pillows as well. Because you have been such a pleasure for us to have in our home, we wanted to thank you with more creature comforts to make your stay even more enjoyable. Welcome! The Sweet Life! Ocean Views from this cozy cottage! August Recess: The Quay townhome, 3 bedrooms, community pool and tennis court. 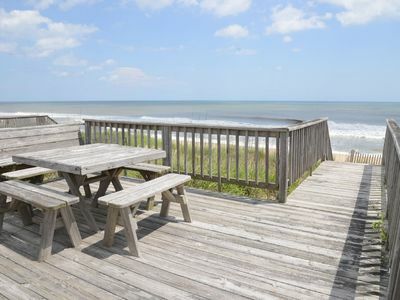 Life Is Good: Only 4 lots from the surf for shelling, swimming and surfing and community pool. D3555 The Gathering Place. Oceanfront in Duck. Pool & Hot Tub! K1900 Sound Sea'renity. 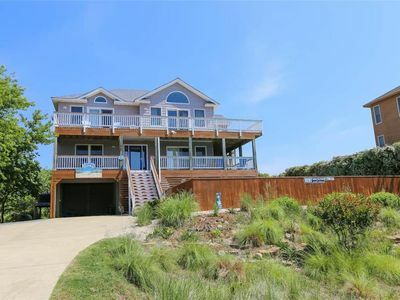 2 Amazing Homes, Waterfront w/Dock, Private Pool! D0214 Satisfied. 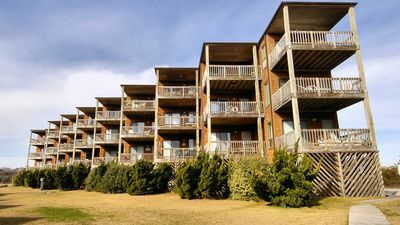 Panoramic Views, Private Pool, Pool Table, Linens Provided! Spacious and beautiful home! Great for family fun &relaxation. 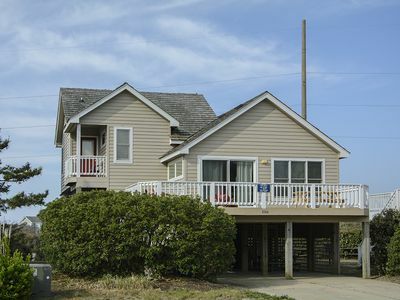 Sweet home for the whole family 10 minutes to the ocean , walk to the Sound! 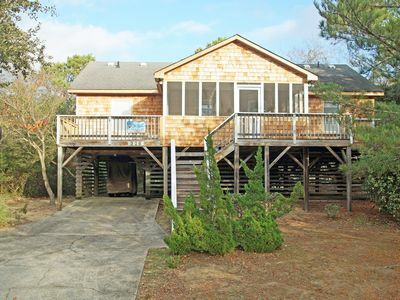 4 BEDROOMS WITH BASKETBALL GOAL, WIFI, CLOSE TO BEACH AND DOG FRIENDLY TOO!! !